"It's a wall," said Homeland Security Secretary Kirstjen Nielsen, standing in the shadow of a newly built stretch of a 30-foot border wall in Calexico, Calif., which she said would help U.S. agents secure the border. "Let me be clear: Walls work," Nielsen said. "That's not my opinion, it's not a tagline, it's not a political statement — it's a fact." Nielsen spoke one day after news emerged that the Pentagon could order as many as 800 troops to the U.S.-Mexico border as thousands of people make their way north from Guatemala in a large migrant caravan. When asked about that development, Nielsen said she requested help from the Defense Department, mainly in engineering and logistics support — and that it is up to military leaders to decide how to accomplish those goals. The military's role "would include vehicle barriers, pedestrian barriers," Nielsen said. NPR's Tom Bowman reports that the troops will also "set up command and control centers, temporary shelters, field kitchens and field medical personnel." The migrant caravan is heading north from Guatemala; it's now about 1,000 miles from the U.S. When asked how DHS plans to cope with the group, Nielsen said her agency will be announcing measures "within our legal construct, to ensure that this is an orderly process, and that those who have no right to be in our country are able to be apprehended quickly and removed." Nielsen's remarks come one day after she spoke to Fox News about the plan to deploy troops at the border. In that interview, she was asked whether a scenario might develop in which migrants who try to rush the border "could be shot at." "We do not have any intention right now to shoot at people," Nielsen replied. "They will be apprehended, however." When Nielsen was asked if the U.S. troops would be armed, she said, "All of the rules of engagement are up to [Defense] Secretary [Jim] Mattis." NPR's Bowman notes that the troops will not "engage with migrants or protesters" because of the Posse Comitatus Act — which bars the U.S. military from enforcing state laws. Instead, they will be there in a support role to bolster a surge of hundreds of U.S. Customs and Border Protection officers along the border. Describing the features of the section of wall in California, Nielsen said, "It's different than a fence in that it's part of a system, so it also has technology — some of which you can see, some of which you can't." "Our hope is that ... it serves as that impedance and prevents a flow over" the wall, she said. Nielsen added, "This is what the president has asked us to do. It's part of a system." 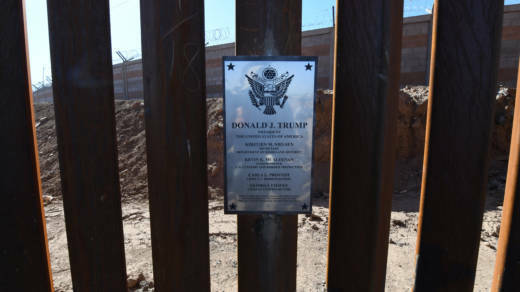 In early 2019, Nielsen said, the government will start building another 11-mile section of the wall, on the other side of the port of entry in the El Centro area. Nielsen praised President Trump for his commitment to building a wall along the border with Mexico, and she repeatedly called on Congress to change America's immigration laws "that have made it nearly impossible to detain and remove those who arrive with a minor." Nielsen called on Congress to fund the construction of a wall — reminding lawmakers of the 2006 Secure Fence Act, in which lawmakers endorsed the idea of adding a barrier and other security measures to around 700 miles of the border. "We do need the wall," she said, "so we will continue to ask Congress for additional funds." The Trump administration's plan calls for the troops to be in place by Tuesday — one week before Election Day.